For Win Tin, a veteran leader of Burma's main opposition party, 6 May should mark a day of disappointment, to say the least. At midnight the National League for Democracy will be forced to disband, having decided not to register for elections this year because of laws it considers unfair. The party won Burma's last elections in 1990 but was never allowed to take power. Since then it has worked without success for democracy, many of its top leaders serving long jail sentences for their activism. 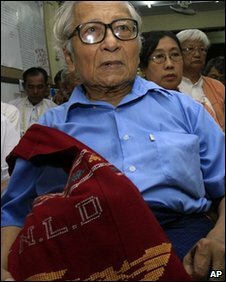 Win Tin, 79, co-founded the NLD and has spent 19 years as a political prisoner in the country's notorious Insein prison. But he told the BBC he had no regrets about his party's decision to boycott the elections - even though the NLD will cease to exist. "These are terrible laws which we do not accept," he said. "How can we accept it?" The laws require parties to expel any member with a criminal conviction. Many NLD members, not least detained leader Aung San Suu Kyi, have been or still are political detainees. The laws also nullify the NLD's 1990 poll win. "The laws are really untrue to us and oppressive and subjective," he said. "We decided as a party, as a whole [to boycott the election]. It it is a great moment for us, it is a great message to the military that our party is sound." He said the mood at the NLD's headquarters in Rangoon was sad but defiant. Some of the party faithful were in tears while others were singing and dancing, or giving speeches. "One of the parents of a young man who is in jail came to the office to bring food for the people," he said. The veteran leader said the NLD's boycott - along with that of several parties representing Burma's ethnic groups - would make it clear to the international community that the elections were "not legitimate and not credible". "[Even] if people vote for us, we cannot win, according to the law and the situation," he said. "For any political party to win is impossible. And according to the constitution, even if we win we cannot form the government, can do nothing." Under Burma's constitution, 25% of the seats in parliament will be allocated to the military. Any constitutional change would require more than 75% approval, meaning that the military endorsement would be needed. There are also reports that several senior members of Burma's ruling junta recently resigned their military posts in order to run as civilians, potentially significantly increasing the number of military allies in the chamber. Win Tin said NLD supporters should boycott the election. "They may want to vote for the NLD or somebody, but such people are not in the election, so they have to refuse to vote," he said. "That will amount to a boycott of the election and if the people boycott the election it will be a great help for the democratic cause." Some members of the NLD are reported to have disagreed with the decision to boycott and disband. Win Tin said they could try to form their own parties and contest the polls. But he insisted that 6 May was not the end of the NLD. "We still have the support of the people, we cannot just put our hands up," he said. "We cannot work as a political party, so we cannot make mass meetings, and put out statements and so on, but we will work among the people. "All over the country we have about 300 offices, so in almost every town we have our offices. We don't mind working for the people as a group not as a party. "Maybe tomorrow the authorities will come and clean our office and order us to disband," he said. "We don't know about tomorrow but we will be here."